That’s what I recall vividly, not because it happened to us—I made damn sure we sat down and ate all the pasta and crab claws we could handle—but because it’s happened to me at every New Year’s party I’ve hosted since then. Apparently if you’re the hostess, you never eat at your own party! OK, maybe I’m being a little overdramatic. I do get to eat a few small plates of food to keep me going throughout the evening, and I’m a snacking fool when I’m prepping all the dishes before the party. But it’s particularly tragic when I get so distracted by chatting and dancing and running around making paella (over an open fire!) 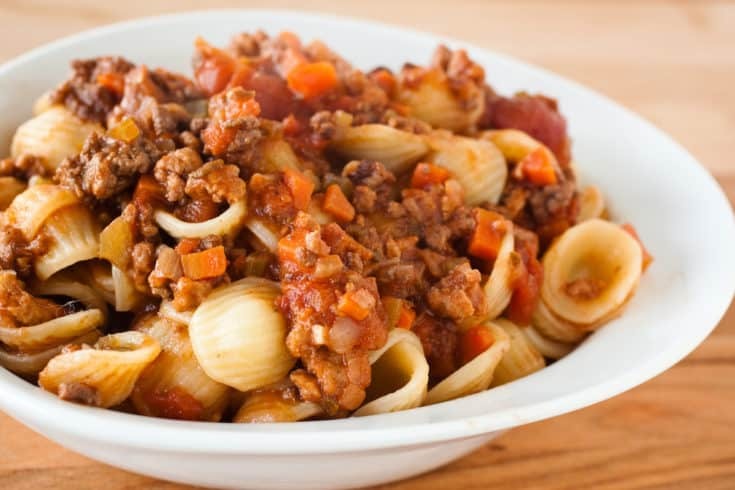 that I forget to eat the orecchiette bolognese that’s been tempting me for two days. OK, OK, I did eat a whole plate of cold pasta for breakfast on New Year’s morning to ring in 2014. But it wasn’t the same as hoovering down a bowl of freshly sauced noodles, slick with hearty, wine-infused, rib-sticking bolognese. Four pounds of pasta and four quarts of sauce were served up for New Year’s Eve, and I ended up with mere scraps. Another vat had to be simmered up solely for my pleasure. Mario Batali’s version of bolognese has been Dan’s favorite ever since our first trip to Babbo, but I always found the end result to be a little wan. Not enough tomatoes, not enough sauciness. I followed the Babbo cookbook recipe to the letter, but it never reached the level of sublime heartiness I hoped for. 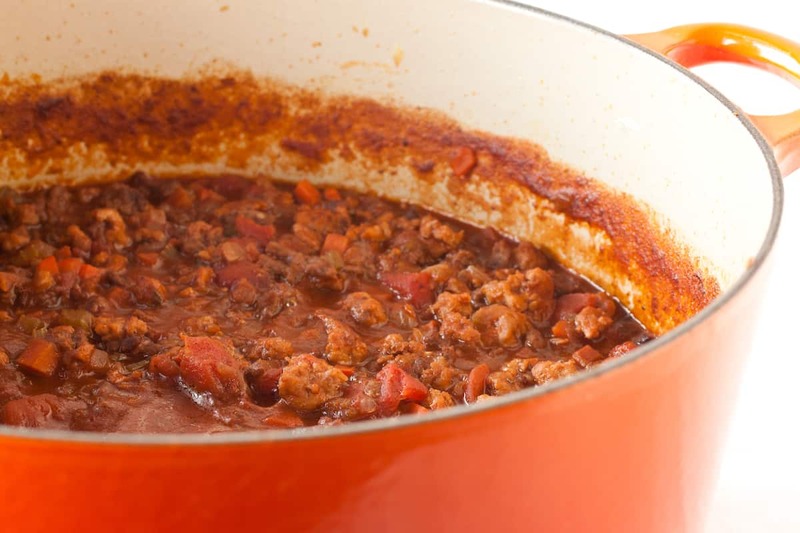 This version (which, as is the case with most of the food I make from rote, is always subject to revision and improvement in my kitchen), combines elements of Batali, Barbara Lynch, and Marco Canora’s bolognese sauces. The key change, however, comes not from the ingredients involved but the way they’re assembled. Even when pressing my 7-quart Le Creuset dutch oven into action, the sheer volume of vegetables and meat involved in this beast of a recipe meant that things steamed instead of seared. Putting a second pan on the range—my favorite All-Clad wide 3-quart saute pan—changed the game by letting me brown the meat separately. The vegetables get their own luxurious caramelizing bath in the cast iron dutch oven, while the beef, pork, and pancetta brown and crisp up oh so nicely in their own fat. When they finally meet up for a slow simmer, it’s a moment worth waiting for. 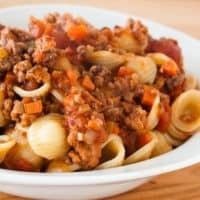 Meaty Italian Bolognese sauce doesn't have to take all day to make; grab a second pan and you'll have it done in 2 hours. In a large (6-quart or bigger) Dutch oven or stockpot, heat the olive oil over medium heat until fragrant and shimmering. Add the onions, celery, carrots, garlic, salt, and sage. Cook, stirring frequently, for 15-20 minutes until the vegetables are very soft and the onions are translucent and just starting to brown. Meanwhile, add the pancetta to in a separate wide, high-sided sauté pan or skillet. Heat over medium heat and cook for 5-7 minutes until the pancetta renders its fat and crisps up. Add the pork to the pancetta, breaking the ground meat up into very small chunks, and cook for about 10 minutes until the pork is very browned and crispy. Scrape the pancetta and pork into a bowl to empty the skillet, and brown the beef in the same way. When the beef is brown and crispy, scrape it into the bowl with the pancetta and pork, and pour the wine into the pan. Bring the wine to a simmer and scrape the bottom of the pan to deglaze and melt all the tasty, crispy, meaty bits into the sauce. While the wine is simmering, check in on the vegetables. If they're cooked down and starting to caramelize on the bottom of the pan, add the tomato paste. Cook, stirring constantly, for about 2 minutes until the consistency of the tomato paste loosens and it starts to darken and stick to the bottom of the pan. Add the milk to the vegetables and tomato paste and stir to make a thick sauce, scraping up any tomato paste bits. Add the pancetta, pork, and beef to the pan, along with the wine, diced tomatoes, and broth. Stir everything together and simmer for at least another hour to 90 minutes to meld the flavors and thicken the sauce.